A few weeks ago I blogged about how wonderful Harvey has turned out to be. The comments were wonderful (and are still coming in). It was suggested that I try the Portland dog park scene. I’m going to confess right up front that the idea was not on my radar for a number of reasons, all of which revolve around some sort of fear. Fear that Harvey would pick a fight with another dog, fear that Harvey would run off, fear that he would act like he didn’t know his name – all of those fears I could easily repudiate without even taking him to the park. 1. He’s a well-socialized dog that has been around strange dogs many times in his life and I have never once seen him growl or raise a hackle. Last May, he met my brother’s two dogs and while they didn’t engage in doggy play, there was hardly a snarl between them. Going back further, when we first introduced Harvey and Murphy, there was not a growl exchanged (although there are occasional territorial growls now, over food). 2. If I put his shock collar on, there would be no reason to think he’d try to run off. 3. Well, he’d still probably pretend he didn’t know his name but the collar would help reinforce that I was calling him. The biggest fear, however, is my own fear. Fear of new situations and the fear of having to go out into a public place and meet new people. The introvert in me was stubbornly digging her heels in about going out and trying. This morning, I felt that dread. I still hurt all over from yesterday, couldn’t I just take Harvey for a walk around the neighborhood? I wouldn’t have to engage anyone and I wouldn’t have to worry about making some sort of social mistake in front of strangers. Don was already gone with Murphy, no one would know I chickened out. I put everything in my car and took a deep breath. Half the time, Harvey refuses to get into the car, so I could always use that excuse: he refused to get into the car until I took him for a walk. But he was more than willing to jump into the car this morning and there I was: forced to follow through. Dang. I decided to go to the historic Luscher Farm and try out the highly rated Hazelia Field Dog Park. For one thing, I know exactly where it is because I drive by there nearly every work night on my way home. I’ve watched the renovation of the historic farm and I can see people with their pooches out in the fenced-in dog park. There are paths to walk on, too, just in case I lost my nerve. Great back-up plan: if I couldn’t just let him go, I could take him for a long walk. There was only one other dog (and owner) in the park when we arrived, a Doberman Pincer that was playing at the far north end of the field. The gates are at the south end. I parked close, put Harvey’s collar on him and took a deep breath. Then we went in to the field and I let him go. He was so overtaken by all the smells that he didn’t even notice the dog at the other end of the park. We walked around one half of the area and I was feeling pretty good about the experience. Then other people started arriving. The first was a couple that did not take their dog off of the leash: a pretty Siberian Husky pup. Harvey was right on that, doing the meet-and-greet. Those folks told me this was their first trip to a dog park and I confessed it was mine, too. Then more dogs came in and there were lots of meet-and-greet circles. Every dog was well-socialized and tails wagged. Someone started playing “fetch” with their dog. Harvey lost interest immediately. “Fetch” is not a game he understands. He isn’t too much into games at all. We left the small crowd to make two more rounds around the entire perimeter of the park, occasionally interacting with other dogs..
We were there about half an hour. The deep black loam soil beneath the wood chips was saturated and Harvey was looking pretty blackened by the time he gave it up. I tried to get him to drink some water, but he wasn’t interested. He was tired, and willingly let me lead him out and into the car. Wear my rubber boots and tuck my jeans inside. My tennies and jeans got very muddy. Bring extra towels. I have extra blankets in the car and he rode on those, but if I had had the towels, I could have hosed him off at the park before I put him back in the car. There’s a hose and an area to do that. Stay longer. We only called it quits because I was tired and sore. Harvey could have lasted a while longer. He did eye the fence. It’s low on the west side and he could scale it if he wanted. I saw him study it. But other than his fleeting contemplation of escape, he was a great dog and he loved the dog park experience. He was panting hard by the time we left. We got back into the car and headed home. Harvey was asleep before we reached the freeway. And me, the fearful dog mommy? I could only think about how inviting that tub looked when I got home. It’s an incredible waste of water, but oh-so-nice on sore muscles and a tweaked back! So glad it went well for you. We haven’t taken our new girl to a dog park yet but the labs loved it there any time we took them. It sounds like Harvey really enjoyed himself. Good for you for overcoming your initial reluctance to go to the dog park. It’s great that you have a place like that available to use. Taking a dog for a walk on a leash is fine, but there’s nothing like going for a good free run! Good job! 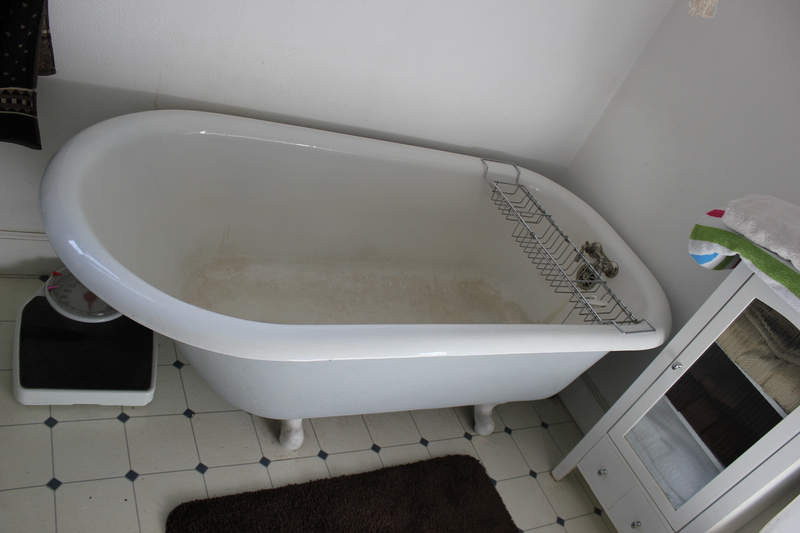 Now for the important part – I love your tub!